Here are some examples of cultural substitution in the built environment that articulate multiple meanings and identify an axis or axes of more than geodetic importance. Every historical site is both monumental and documentary and connected by a visible, invisible and visual logic appropriate to the accumulated cultural production and reproduction in and on those sited places. Their axes are found in the historical logic of spaces as one interprets both a structural replacement/displacement and a substitution/transference of modern power. Every place has not only its sense, but its agency and structure, constructed and deconstructed by its history. The urban history of the built environment, rather than valorizing and commodifying aesthetic attributes, might be better served by studying the transfers of development rights and the formation of historical space in the cycles of construction, demolition, and creation of open/closed spaces on the same geodetic sites. Whether facadism or roof-ism, it is what all occupation movements try to do, as the sublimated mode of production becomes historically sedimented and occasionally excavated. It is a data base with an information superstructure, layered onto the intertextual determinacies of urban plans. The first example buries the sign, the second projects the sign by projecting a plan, the third substitutes the sign because location, location, location(sic). Place remains yet disappears, only to reappear in new, more virtual forms. 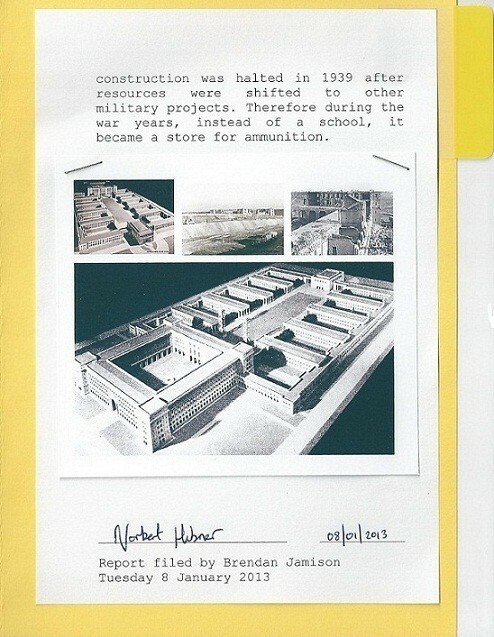 There is always sedimented meaning in every urban site: example one has cold war surveillance built on WWII rubble; example two has the logic of the modern capitalist state imposed on colonized histories; and example three replaces one stage of commercialized colonialism with the structures of modern governmentality. The ruins of the NSA Cold War listening post set atop an artificial mountain built on the rubble of WW2 covered one of the Reich’s buildings, the Military-Technical university in Berlin. 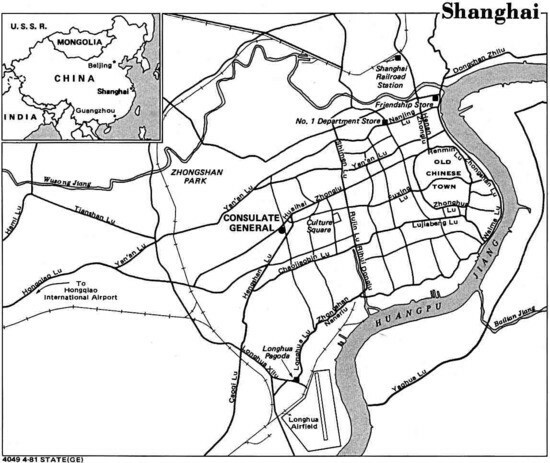 Example Two: Shanghai and Nanjing, China – The unbuilt capitals of Modern (interwar) China one commercial and the other governmental, but both built using European modern plan-logic and yet kept the feng shui orientation to North and relocated themselves as planned, modern new capitals away from the historical old cities like Washington DC, Brasília , Chandigarh, Canberra, (soon Cairo — built by China) etc. Example Three: Singapore — a modern city-state with minimal land area that carries a similar logic to the above examples by replacing the place of the commercial colonizer with the governmental seats of national and civic administrative power. During the NSA Operations some other curious things happened: It was noticed that during certain times the reception of the radio signals was better than during the rest of the year. The ‘culprit’ was found after a while: it was the Ferris wheel of the annual German-American Volksfest Festival on the Hüttenweg in Zehlendorf. From then on, the Ferris wheel was left standing for some time after the festival was over. Teufelsberg (German for Devil’s Mountain) is a man-made hill in Berlin, Germany, in the Grunewald locality of former West Berlin. It rises about 80 metres (260 ft) above the surrounding Teltow plateau and 120.1 metres (394 ft) above the sea level, in the north of Berlin’s Grunewald Forest. It was named after the Teufelssee (i.e. Devil’s lake) in its southerly vicinity. 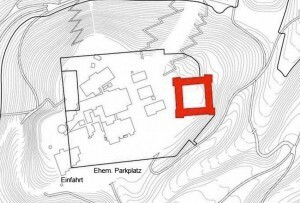 The hill is made of rubble, and covers an under-construction Nazi military-technical college (Wehrtechnische Fakultät). During the Cold War, there was a U.S. listening station on the hill, Field Station Berlin. 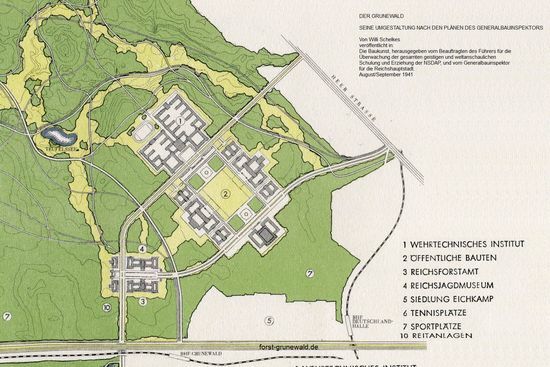 Although there are many similar man-made rubble mounds in Germany (see Schuttberg) and other war-torn cities of Europe, Teufelsberg is unique in that the never completed Nazi military-technical college (Wehrtechnische Fakultät) designed by Albert Speer is buried beneath. The Allies tried using explosives to demolish the school, but it was so sturdy that covering it with debris turned out to be easier. In June 1950 the West Berlin Magistrate decided to open a new rubble disposal on that site. The disposal was planned for 12,000,000 m3(16,000,000 cu yd). Welthauptstadt Germania (“World Capital Germania”) refers to the projected renewal of the German capital Berlin during the Nazi period, part of Adolf Hitler‘s vision for the future of Germany after the planned victory in World War II. 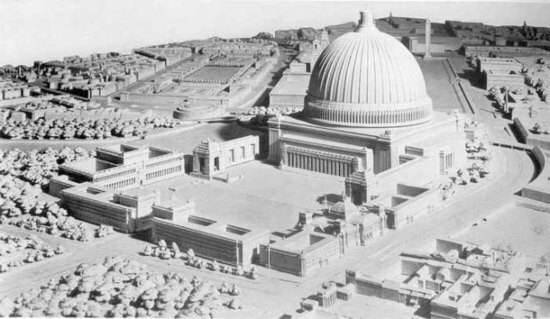 Albert Speer, the “first architect of the Third Reich“, produced many of the plans for the rebuilt city in his capacity as overseer of the project, only a small portion of which was realized between the years 1937 and 1943 when construction took place. Some projects, such as the creation of a great East-West city axis, which included broadening Charlottenburger Chaussee (today Straße des 17. Juni) and placing the Berlin victory column in the centre, far away from the Reichstag, where it originally stood, were completed. Others, however, such as the creation of the Große Halle (Great Hall), had to be shelved owing to the beginning of war. A great number of the old buildings in many of the planned construction areas were, however, demolished before the war, and eventually defeat stopped the plans. 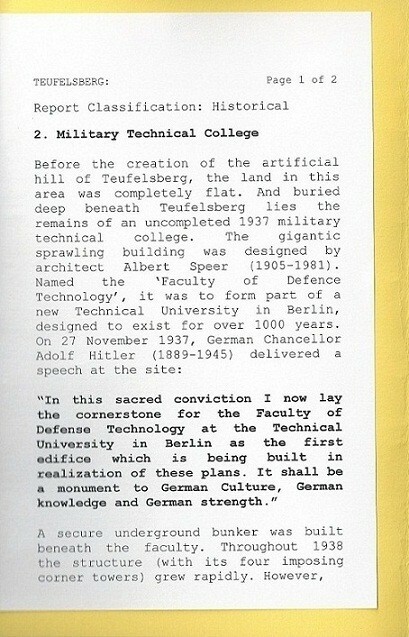 The history of the historical site goes back to 28 November 1937, when Hitler laid the first stone for the Wehrtechnische Fakultät – a military school. Except for a contribution to Nazi Germany’s military force, the Wehrtechnische Fakultät was a part of the project to develop the Ost-West Achse – a planned axis from the city centre East (Alexanderplatz) – passing the Siegessäule which was relocated from the Königplatz (now: Platz der Republik) to its current destination (the Großer Stern) in 1938, the Technische Hochschule (now: Technische Universität), the Adolf Hitler-Platz (nowadays: Theodor-Heuss-Platz) to the city’s West, where the Olympic Stadium on the northside and the Hochschulstadt – the covering term for the militair complex where the Wehrtechnische Fakultät was part of – should came on the southside. The Wehrtechnische Fakultät should have taught the new military elite. Seven years after the Second World War, the site around the unfinished Wehrtechnische Fakultät became the last destination of the city’s ruins. Within 1952 and 1972, 26 million cubic meter of devestated buildings were heaped there – which is about a third of Berlin’s bombed buildings after the war. The nearby Teufelssee gave the name to the mountain, now called the Teufelsberg. 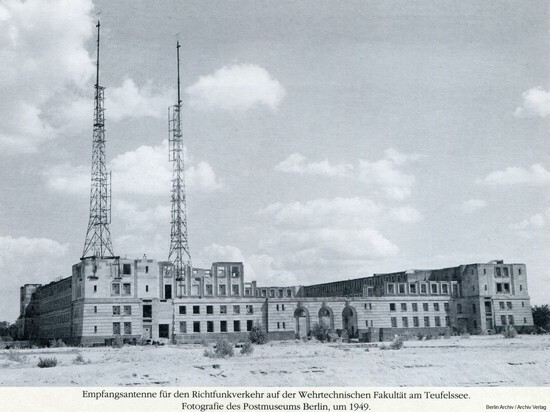 Although the site was located in Wilmersdorf, a part of the English sector, the Americans were allowed to used the Trümmerberg from 1957 onwards to experiment with picking up radio signals in the area of the newly formed Warschaupact. The mound Teufelsberg is 120.1 meters high, the highest place in Berlin. Built on the remains of 2nd World War bombed-out Berlin. All the rubble that couldn’t be used for the city’s reconstruction were run out here in the suburbs, where they initially covered the remains of what should have been the University of the World Capital, Germania’s Department of War Technology. (Left) Wehrtechnische Fakultät, the first and largest building of what should have been Germania, the world capital of the Third Reich, University City. (Right) The listening station at Teufelsberg before the trees covered the hill, and the graffiti and decay took over the buildings. 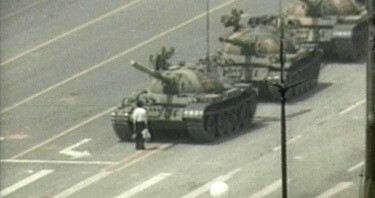 The Americans left the place in 1992. Photos Peter Wang. The Nazis worked on their project in Grunewald from 1937 until 1942 but they never finished. And now, on the remains of Hitler’s and his architect Albert Speer’s megalomaniac visions, the abandoned towers of the Cold War’s victorious power – as a history’s ironic comment – resides. The Sino-American Treaty of Wanghia was signed in July 1844 by Chinese Qing government official Qiying, the Viceroy of Liangguang, who held responsibility for the provinces of Guangdong and Guangxi, and Massachusetts politician Caleb Cushing (1800–1879), who was dispatched with orders to “save the Chinese from the condition of being an exclusive monopoly in the hands of England” as a consequence of the 1842 Nanking treaty. Under the Treaty of Wanghia, Americans gained the same rights as those enjoyed by the British in China’s treaty ports. It also contained a clause that effectively carved out Shanghai as an extraterritorial zone within Imperial China, though it did not actually give the American government a true legal concession. By the late-1860s Shanghai’s official governing body had been practically transferred from the individual concessions to the Shanghai Municipal Council (工部局, literally “Works Department”, from the standard English local government title of ‘Board of works’). The British Consul was the de jure authority in the Settlement, but he had no actual power unless the ratepayers (who voted for the Council) agreed. Instead, he and the other consulates deferred to the Council. The Council had become a practical monopoly over the city’s businesses by the mid-1880s. It bought up all the local gas-suppliers, electricity producers and water-companies, then — during the 20th-century — took control over all non-private rickshaws and the Settlement tramways. It also regulated opium sales and prostitution until their banning in 1918 and 1920 respectively. The grandiose designs and planning for the Shanghai Civic Center of 1930s represent the ambitious attempt of the newborn Republican government to promulgate its political authority over the city while emphasizing national identity through the traditional look of the buildings. Following the historic opening of China to the Western world, and the turn of the twentieth century, foreign architectural and planning influences started to appear in Chinese urban landscapes, mostly imported directly from the West. As in Shanghai, a prototype of cosmopolitan modern cityscape in China, foreign architectural firms, such as Palmer and Turner, Spense Robinson and Partners, and Atkinson and Dallas, made an appearance. 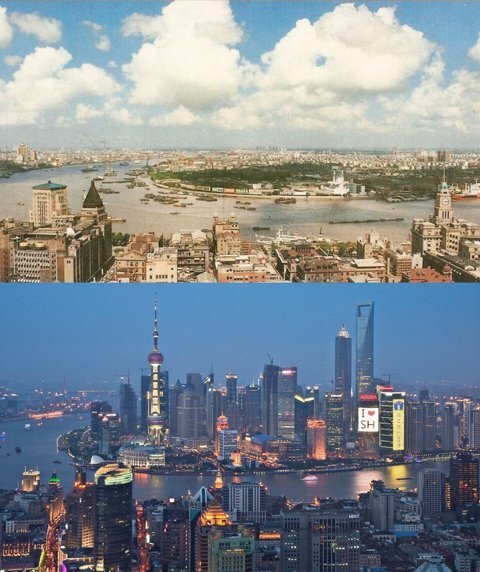 Since the signing of the Nanjing Treaty, Shanghai had been the most open and lucrative economic entity in China during the period, and the city has consistently encapsulated foreign influences and progressive modernism, as the formation of the politically autonomous areas (i.e. the international concession and the French concession) and the forest of Neo-Classicist and Art Deco architecture epitomizes. The Hong Kong and Shanghai Banking Corporation, Shanghai. Source: Peter G. Rowe, and Seng Kuan, Architectural Encounters with Essence and Form in Modern China. Most of the Corresponding to the return of Chinese architects (so-called China’s First Generation of modern architects, including Zhuang Jun, Liang Sicheng and Dong Dayou), foreign engineers in China had already experimented with incorporating Chinese architectural features into their designs… and during the 1920s, there arose the ‘Chinese Form’ movement (中國固有形式 zhōngguó gùyǒu xíngshì), which was characterized by the use of a Chinese roof on a steel and concrete structure, and the use of traditional decorative motifs and sometimes of traditional spatial organization. Dong Dayou’s Mayor’s Building in Greater Shanghai Civic Center. Source: Seng Kuan, Between Beaux-Arts and Modernism: Dong Dayou and the Architecture of 1930s Shanghai. According to Jianfei Zhu, this was an attempt to restore traditional cultural values and Confucian learning in modern Chinese architecture, and this practice was further promoted by the republican government in the Shanghai and Nanjing planning proposals in 1929. 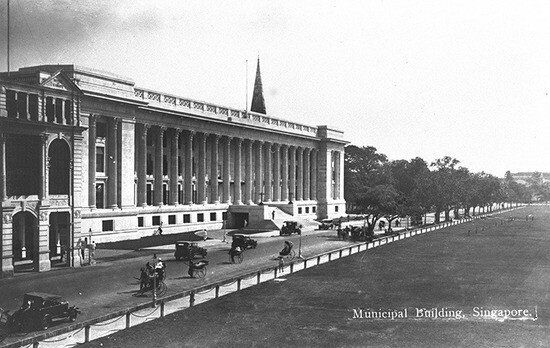 For instance, the Mayor’s Building in Greater Shanghai Civic Center, which was designed during the 1930s, had neoclassical proportions and adhered to the Western compositional principle, while employing decorative elements from the palace and temples of ancient China in its façade and interior spaces. At the most superficial level, the primary issue, which confronted the nationalist officials was that of constructing a bound polity drawn together by a set of grand symbols, shared cultural legacies and moral consciousness of political unity. As a result, the architects of Nanjing attempted to promulgate a set of horizontally universal values via their building designs, which could effectively replace the hierarchically stratified values of a previous cultural order under the Qing Dynasty. The Ministry of Railways, Nanjing. Source: Charles D. Musgrove, Building a Dream: Constructing a National Capital in Nanjing, 1927-1937. 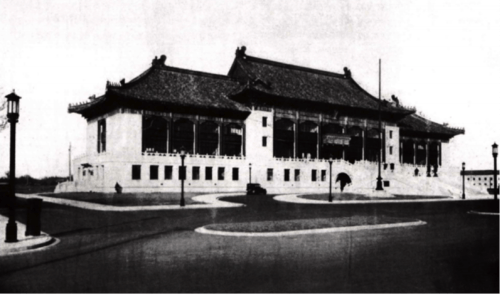 Thus the architecture of Nanjing can be summarized by an amalgamation of the cultural spirit of Chinese culture – curved roofs and traditional interior ornaments – and the modernity of Western civilization – Beaux-Arts influenced imperial design with modern construction materials, which would result in an ostentatious display of national dignity and the political authority of the regime. Through the hybrid of Chinese culture and the Western concept of architecture, the new city-designs of Nanjing focused on a promotion of ‘societal consciousness’ (民主意識 mínzhǔ yìshí) to create a sense of national community under the nationalist regime. Thus, through emphasizing “monumental features” of its cityscape, the nationalist government promoted both visual monumentality and the profound psychological memories of Nanjing, associated with modern political sovereignty. 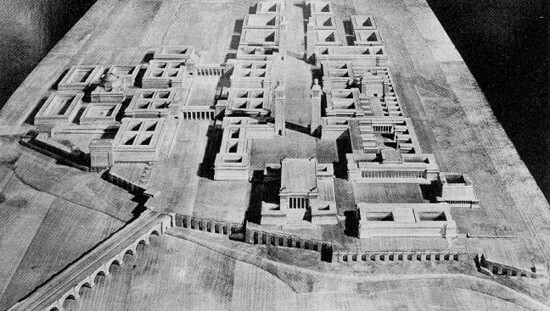 In addition, with the influence of the City Beautiful Movement that emphasized the creation of large-scale public spaces and elaborate public buildings along wide parkways, the architects of Nanjing attempted to benchmark the layouts of other capital cities in the world, mostly those of Washington D.C. and Paris. Therefore, the planners envisioned the new capital with wide boulevards, malls and parks, resembling the National Mall of Washington D.C. In short, Nanjing’s main streets and districts were an extravaganza of Chinese cultural consolidation and nationalist displays. Top-ranked plan for Nanjing’s central administrative zone. Through Nanjing’s architecture and city layout, the nationalists attempted to reorder society through the imposition of an ideological and aesthetic discipline, and to foster ethno-nationalist pride and development. As Zhu summarized, Nanjing as a republican capital can be explained in ideological, spatial and social terms: (1) Ideologically, the architectural style of Nanjing was the consequence of Lenin, Sun and Chiang’s varying but consistent support for constructions of national independence from colonialism and imperialism; (2) In spatial layout and construction, the overall nationalist social order was pervasive in all cities and regions ruled by the party; (3) In social terms, a Chinese bourgeois space and cosmopolitan society had already existed before 1927, and the KMT’s imposition of a new layer of urban order and meaning – with a nationalist ideology and modern state-building – was not only visual and symbolic, but also real and instrumental. As discussed earlier, the nationalist government in Nanjing was a result of the prolonged geopolitical revolution against the anachronistic Qing Dynasty and Western imperialism, and as the KMT regime sought to openly inculcate a modern cosmopolitan urbanism, with the new national pride and sense of “Chineseness”, a vibrant aesthetic and architectural culture appeared in Nanjing. …the urban landscape of Nanjing was an amalgamation of Chinese-style architecture upon modern configuration. 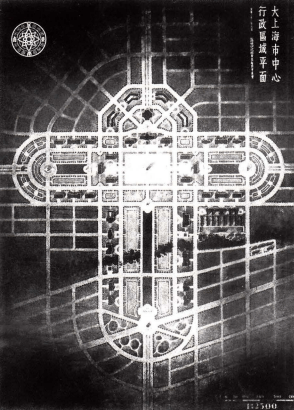 The capital plan of 1929 displays a civil construction of a modern city with a set of commercial buildings and private industries as well as the KMT’s government and municipal complexes. The forms of government offices and public buildings were required to adopt a Chinese architectural design, with the prolonged tradition of pre-modern imperial palaces included, while the city layout adopted a Beaux-Arts composition of diagonals in a grid of orthogonal lines. In addition, the distinctiveness of a large and open space, specifically aimed at holding a large-scale public gathering, should be noted. The Capital Plan of 1929 advocated a combination of “principles of European-American science and technology” with the artistic tradition of China. Influenced by the early-generation of Chinese architects, who were trained either in Western Europe or in the United States, and with the presence of Western architects in China (i.e. Henry K. Murphy and Ernest Goodrich), Nanjing’s urban landscape was a hybrid of the imperial architectural tradition from pre-modern Chinese dynasties, with European Beaux-Arts and neo-classical compositions. 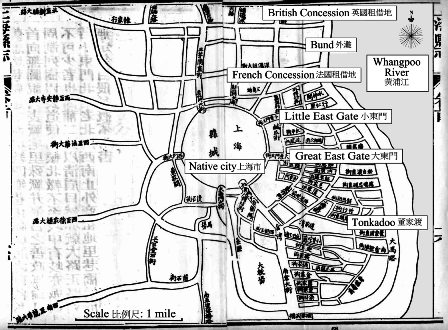 Therefore, Nanjing’s architecture and urban planning were an active “reinterpretation” of Chinese culture in a modern, republican setting: diverse constructive elements were alloyed to promote a hybrid synthesis of Western science and technology with Chinese culture and values, thus demonstrating a progressive and modern ideological politics of the nationalist regime. Between 1871 and 1931, Singapore’s population increased from less than 100,000 to over half a million, due to the huge influx of immigrants. The majority of early Chinese immigrants called “sinkeh” who arrived in Singapore were indentured to a “kongsi”, and their services were engaged through a coolie agent or headman, otherwise known as a “khektow”. Most came from 5 small regions in the southern provinces of Guangdong, Fujian and Hainan. By 1890s, these migrants were refered to as “huaqiao” or “overseas Chinese”. The story is not only about the plan, but the logic of colonialism and its governance. 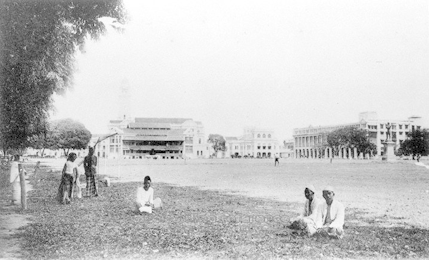 Controlling axis from the Padang on HIgh Street to Hill Street, in front of the old jail, past that intersection up to the Fort Canning hill and its segregated cemetery. On this axis are the major institutions, the cricket club, the police station, and the supreme court building that replaces on the same site, the European Hotel where Joseph Conrad, Ernest Hemingway, and W. Somerset Maugham stayed and wrote. These are the loci of governmentality for colonial power over the colonial body. In November 1822, Sir Stamford Raffles wrote to the Town Committee, directing attention to the ‘proper allotment of the Native divisions of the town, and the first in importance of these is beyond doubt the Chinese’. ‘From the number of Chinese already settled, and the peculiar attractions of the place for that industrious race, it may be presumed that they will always form by far the largest portion of the community. 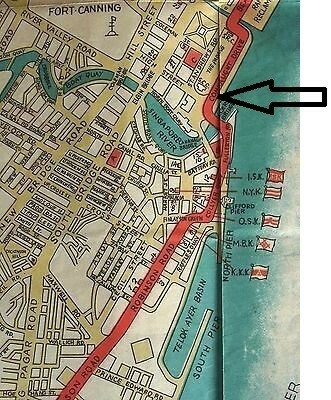 The whole therefore of that part of the town to the south west of the Singapore River is intended to be appropriated for their accommodation’. 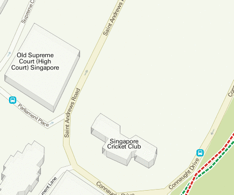 The Singapore Cricket Club carefully demarcated the field in the middle of the picture, as if to claim exclusive usage of the field… Eventually, the club experienced an abrupt suspension of its activities when most Europeans either escaped or were interned during World War II (Singapore Cricket Club, 2012). 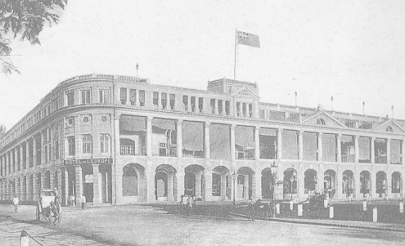 During World War II, the Club became an exclusive Japanese officers’ club (Uma, 2002)…The ethnic makeup of the members was adjusted when it was decided in 1962 that all clubs in Singapore needed to maintain at least 50 percent Singaporean membership (Singapore Cricket Club, 2012). The streets shown in the picture are very wide and orderly. The absence of the bicycles, rickshaws and ox carts here speaks volumes about the care taken to keep this place as ‘untainted’ and high class as possible. The Singapore Cricket Club carefully demarcated the field in the middle of the picture, as if to claim exclusive usage of the field. 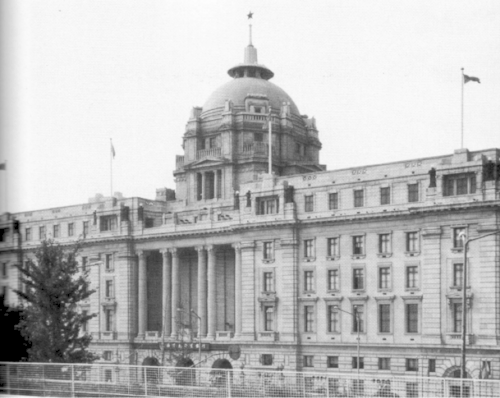 For several years, the Hotel De L’Europe building was left unoccupied until 1934, when a decision was made to demolish the building in favour of modern service flats. After the work in construction of the flats commenced “within the shell of the old Europe” (The Straits Times, 1939), the government, in a surprise move, acquired the land (The Straits Times, 1934). Britain’s rearmament drive caused a steel shortage and delayed construction until 1937 (Sutherland, 2010), and construction was completed in 1939. While the building is modelled after the Old Bailey in London (Cornelius-Takahama, 1999), its colossal Corinthian columns echo neighbouring City Hall while the dome is a miniature version of the dome of St Paul’s Cathedral in London (Heritage Trails, 2012). The completion of the Supreme Court building only marks the realization of one piece of the grand puzzle that Frank Dorrington Ward had in mind. Now monumentality and governmentality get contested in the context of mediated information that circulates nearly exclusively and is reproduced while detached from physical places. On 4 June 2013, Sina Weibo, China’s most popular microblog, blocked terms whose English translations are “today”, “tonight”, “June 4“, and “big yellow duck”. If these were searched for, a message appeared stating that, in accordance with relevant laws, statutes and policies, the results of the search could not be shown. 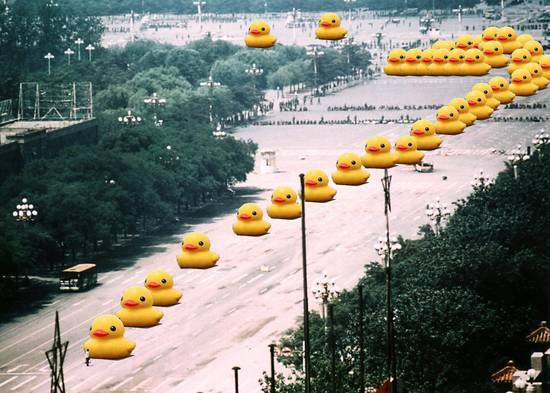 The censorship occurred because a photoshopped version of Tank Man, in which rubber ducks replaced the tanks, had been circulating around Twitter — a reference to Florentijn Hofman‘s Rubber Duck sculpture, which at that time was floating in Hong Kong’s Victoria Harbour. This entry was posted in architecture, Art, built environment, China, Germany, History, landscape, Media, Uncategorized, World War I, World War II and tagged architecture, Berlin, built environment, china, city planning, Cold War, environment, Geography, History, Media, urbanism. Bookmark the permalink. 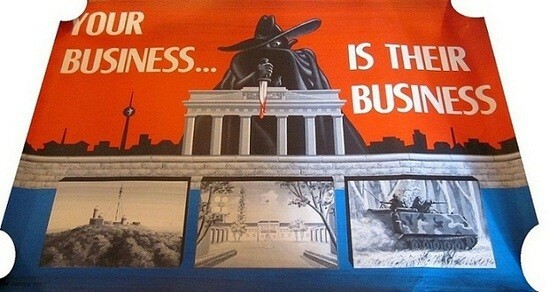 Reblogged this on virtual capital & political economy.